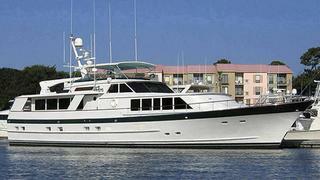 News from David Wiest at RJC Yachts about a $600,000 price cut to the 26.37m Burger motor yacht Heritage. Built in 1987, she is one of the last Hargrave-designed yachts to be built by Burger, with classic lines, full walk-around decks and a hull capable of cruising at 17+ knots with a top end speed of over 20 knots. She can accommodate 6 guests in a full beam master stateroom and two twin guest staterooms. She has been extremely well maintained and just completed a total interior refit, which included refinishing all wood joinery throughout the vessel. David tells me that the owner is moving to the west coast, and will no longer have the opportunity to use her, so is extremely motivated to sell. Her new asking price is $1,195,000, down from $1.8 million.